Burda of the Month: 5/2014 #131 in polka dots! It's pattern 5/2014 #131, which is shown in the magazine in both satin (version A) and cotton (version B) - is it just me that thinks it's a bit cheeky of Burda to count these as two patterns when the only difference is the fabric and a few pieces cut on the grain differently? It looks far better tucked in I think than worn out. I decided to make the collar from a plain black mystery fabric from the stash in the same weight and slipperiness as the polka dot fabric (probably polyester too, I'll have to remember not to stand too close to a naked flame!). I think using a solid black for the collar instead of the polka dot fabric makes it stand out more, although this shirt is obscenely low cut in true Burda style so I don't know if I want to draw attention to that. But all this is on the inside which no one sees and I'm usually too lazy to make the insides that nice - as long as it's not fraying I don't really care! I do admire those who do wonderful work on the inside too, but it's just not me. The other shortcut I took was to leave off the opening placket and buttons on the sleeve hem - I just made a simple cuff and left it at that. Burda describes this as a straight cut blouse which it certainly is because it has no darts and minimal shaping. I was highly tempted to put some vertical darts in the front and back to take out some of the puffiness, but I thought I'd wear it a few times before deciding whether it needs it or not. The gathers at the front and back at the yoke seam are lot more subtle than the technical drawing suggest, but looking at the model's photo I can see that her blouse doesn't have any obvious gathers there either. So overall I think this is a nice enough blouse that I may make again in a lightweight cotton or possibly a silk. If I do make it again I would raise the centre front because no one needs to see that much of my bony, freckly decolletage, and I would also reduce the excess fabric in the sleeve so that it doesn't have any puffiness. And apart from my usual narrow shoulder adjustment the fit is pretty good - I can recommend this pattern to anyone who is looking for a simple but pretty blouse. 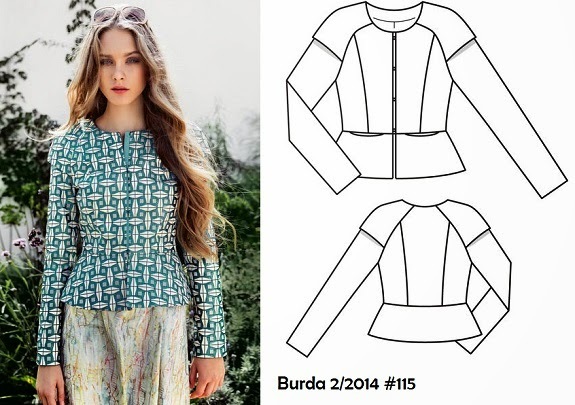 Burda 2/2014 #115: print matching to make you cross eyed! Thanks everyone for your excited comments about my debut in Burda Style - I was a little bemused by the whole thing and didn't think much of it until a sewing friend pointed out on the weekend how many people sew Burda patterns and how few people make it into the magazine so I do realise that it is quite special and I feel properly flattered now. Speaking of sewing friends, I had an unbelievably productive and fun weekend away at the sewing retreat that was organised by Sharon who blogs at Petite and Sewing. Thirty-eight or so ladies in one big room sewing, chatting, laughing punctuated by meals and sleeping of course but uninterrupted by cute but demanding children is my idea of a great weekend away. Plus I managed to get so much done: two shirts, a skirt and a dressing gown for Anna. Now I'm in the rare position of having finished projects that I need to catch up on my photo shoots. But to use that old cliche - here's one I prepared earlier! 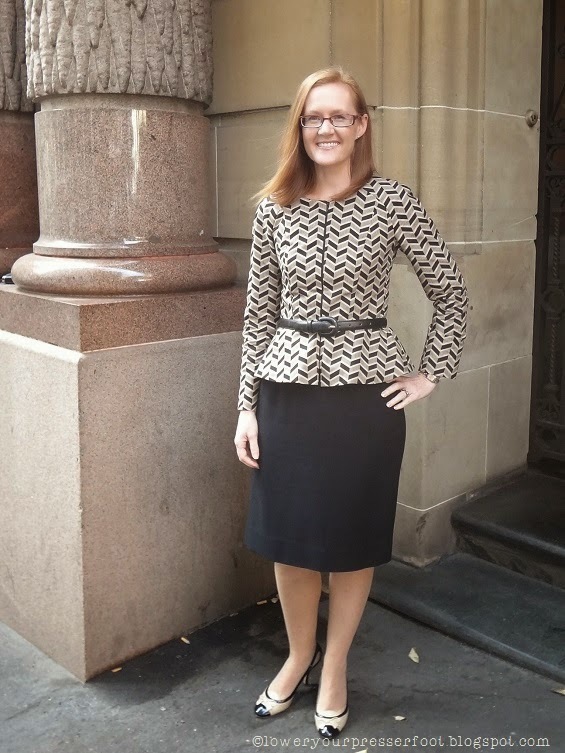 The lovely Gabrielle of Up Sew Late graciously met me at lunch time today outside my office to take a photo of jacket I finally finished early last week, many weeks after I started it. And the good news is that I love it so much that I've already worn it twice. Like the cream linen version I used a lightweight open ended zipper at the centre front instead of hook and eye tape because it is much easier to wear - no snagging or falling open. But unlike the cream linen version I finished this jacket properly and lined it with bemsilk lining which makes it more comfortable to wear because it slides over the clothes underneath much easier. As I said on the post for the previous version of this jacket, the pattern drafting is really good and the fitting changes I needed to do were mainly caused by my narrow shoulders and non existent bust line. The only issue I have with this jacket is that the neckline is quite low on the front and back, and a lot of my dresses didn't go with this jacket because they peeked out a little bit at the neckline. I think it would look good with either a roll neck top deliberately poking out of the top or something that has a low neckline so that it stays hidden underneath to make it look clean at the neckline. And even though I'm not doing me-made-May (because I'm too lazy to take photos each day, not because I don't wear something hand made every day), today I wore with this jacket a handmade dress made from Vogue 8280, the Roland Mouret galaxy dress knock off that I don't seem to have blogged so I must have made it so long ago, but still looks good. But to all of you doing me-made-May you have my congratulations because taking a photo each day let alone thinking of outfits to wear must be a huge undertaking! I'm in Burda Style magazine! Yes, that would be little old me in the bottom left hand corner of the German issue of the June Burda magazine! Anna said "mummy, you're a sewing superstar!". Well not quite, but it is rather exciting/amusing/flattering all at the same time. I wish I had uploaded a better photo though. 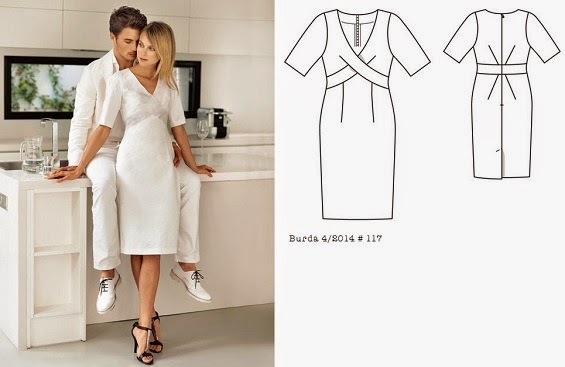 I received an email from someone at Burda Style a few months ago, asking my permission to use a photo I had posted on my Burda Style projects page, potentially for use in the magazine. Of course I said yes, not really expecting it to happen, but there I am. I must say I am impressed by the German version of the Burda Style magazine - it so much more like a fashion magazine than the English version I receive. The patterns and instructions are in a separate supplement at the back of the magazine, and the main part has an editorial from Dagmar Bily, ads for various products, fashion exhibition listings and styling tips in among the pages of photographs of the patterns. The patterns are the same though - and we all know how good, bad and just plain ugly they can be! The other interesting thing is the mix of English words amongst the German text - there seems to be no reason for English headings to be followed by text in German, but I guess it makes it a bit more eccentric and interesting. Not much sewing for me to show this week - I have finished an awesome jacket but haven't had a chance to photograph yet due to the short winter days, and the other sewing I've done is boring but necessary repairs - replacing a lining in a dress, replacing a busted zip and fixing up a fallen hem. But this weekend I'm off for a glorious several days of uninterrupted sewing with quite a few other sewing fanatics so I'm hoping to make up for lack of sewing and then some! I finished my April Burda of the month project a few days ago but haven't had a chance to photograph it yet. Honestly it turned out rather bad so I was tempted just to bin it but I wanted to reassure you all that I'm only human and make my fair share of wadders too! I did intend this to be a hopefully wearable muslin and I do have extra fabric to fix up the issues and remake it, but sadly I'm lacking enthusiasm for spending anymore time on it right now. Too good to be true in the way only Burda can achieve! I made my version in a teal green ponte knit that I ordered on line from Girl Charlee fabrics. When it arrived the colour was more subdued than I had hoped from a fabric described as teal green, but the fabric felt weighty with a good amount of recovery so I thought it would be well used as a first version of this dress that I was hoping would be a wearable muslin but no harm done if it didn't turn out well. And turn out badly it did! So I need to completely re-do that bodice to pinch out the extra fabric because this version is totally unwearable. The neckline doesn't gape too badly though, and although it's low it doesn't reveal my bra so really it's not that low for Burda standards. I found the instructions to be completely baffling, and I really tried hard to follow them this time. I think their method meant the top cross over piece was left unstitched where it crossed over the under cross over piece, with the seam allowances folded under, which now that I look closely at the line drawings might actually be what they meant. Their method didn't make any sense to me at all and in the end I followed the photo instructions that Sigrid helpfully has in her pattern review - this way was much better but it still involved a small bit near the triangle top of the skirt at the centre front unsewn. I just used a bit of steam a seam to glue the bits together! Inside of the dress is a complete mess because of the overlapping facings and darts of the complicated front. So will I make this again? Probably not - I like the idea of the pattern but the arrangement of the front pieces is just messy, even if I did manage to get rid of the excess fabric. Onwards and upwards to the next pattern! And the added bonus is that this fabric didn't even make it to the fabric stash from the letter box. I might just cut it in half and make a straight skirt from it, if I can think of a suitable top to wear with it - it's a very difficult colour to find a complementary colour top. Finally thanks for all your wishes regarding my father in law and Anna. Anna's arm is healing very well and she has a brand new purple cast which she not only loves but weighs less and is slim enough to wear under her normal clothes which makes it a bit easier.